Prolonged dry spells, insect plagues, and controversial public policy decisions mean there are now nearly 130 million dead trees across the state. Drought, insects, and decades of public policy that interrupted the natural rhythm of forest ecosystems have left the slopes of the Sierra Nevada mountains crowded with dead trees, raising the odds of bigger and harder-to-fight wildfires in the future, California researchers warn. Those mountain forests evolved centuries ago in an environment where fire was a common occurrence — but they also looked “very different than what we would see today,” said Brandon Collins, a forester and research scientist at the University of California Center for Fire Research and Outreach. Fire clears space for younger, healthy trees, opens the land to more sunlight, and gives new vegetation the chance to grow. It also destroys dead wood and underbrush. But for a century, the US Forest Service and state agencies tried to prevent or beat back fires. Without those blazes, forests grew denser, forced trees to compete harder for water and sunlight. Some forests in the Sierras have four to five times as many trees per acre as they would have had in the past, said Collins, who co-authored a recent study on the matter. That’s made them more susceptible to drought and plagues of insects like bark beetles. Throw in a deep, five-year dry spell, and the result is nearly 130 million dead trees across the state — while climate change is heating things up, making fires bigger and more intense. 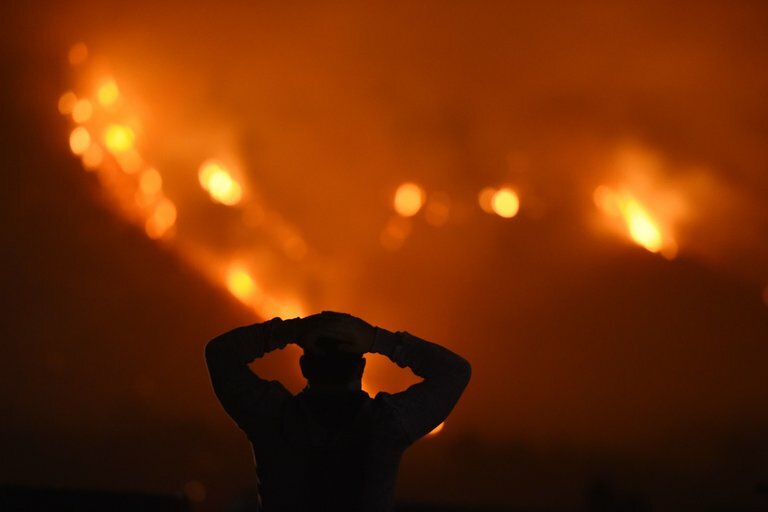 So much of the environment is primed for a massive, catastrophic fire — the kind that burns so hot it can generate its own wind and weather, spreading rapidly and making it harder for authorities to protect the public. The areas Collins and his colleagues studied are far from blazes around Los Angeles and San Francisco that killed more than 40 people and scorched nearly a million acres from October to December. The nearby towns are mostly small, but some of them “are fully embedded” among stands of dead trees, Collins said. Wildland managers have known for decades that the old policies need to change. Today, they’re more likely to let small fires burn or set controlled blazes to clear brush and dead wood, or allow more logging of beetle-infested or fallen trees. But Collins said authorities need to get ahead of the problem in forests that aren’t already choked with dead trees, rather than waiting until after a fire to restore the woods.